You’re at the water cooler on a Monday morning and hear your colleagues having a laugh about the MAMILs (Middle-Aged Men in Lycra) taking over the local café on Saturday morning. They’re overweight, wear mismatched gear, typically order a skinny latte and range somewhere between the age of forty-five to sixty-five. I was intrigued and inspired. Maybe one day I could be Mystique? But how? While riding with the Hurt Box training group I’ve been able to get up close and personal with a real life Mystique. He goes by the name of Steggles and he’s an inspiration to anyone who cycles. At fifty years of age David is tough as nails. 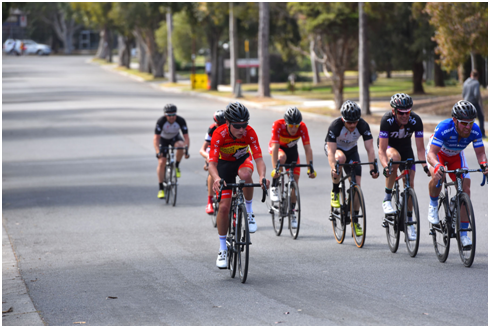 You’ll see him appearing up the rankings whether he’s participating in the local A grade crit races or Victorian Road Series events. This year David finished fourth in the Tour of the Southwest, outperforming some seriously good riders. So how does he do it? I recently interviewed David to understand the ingredients required to become a Mystique, as life takes its course. There’s no doubt that David is a competitive beast. He’s been racing on and off for almost thirty years and has a solid foundation of physical and mental conditioning behind him. He’s raced multiple Sun Tours, raced the Melbourne to Warrnambool Classic five years straight (1993-97) and competed in more than fifteen Tours of Bright. At the Sun Tour in 1995 David rode alongside Robbie McEwen and Henk Vogels, supporting their efforts to impress on local soil. Notably, he was forced to ride like a pro when he was made part of their team time trial and given no other option but to finish! Maybe that’s the secret sauce right there; a man clearly up against the odds, time trialling with world-class professional riders, digging deep, and just getting the job done. David has had to big deep so many times in his cycling career that it’s now just a habit. 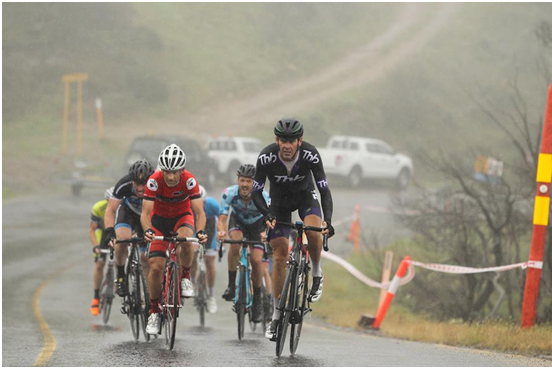 David in the black and purple kit rolling turns with some semi professional riders at the Glenvale A Grade Criterium. David manages his own business, family affairs (including two teenage boys and a daughter), married life and a training schedule that ensures he stays in tune. Structure: A lot of common MAMILs might ride once or twice a week, and every now and again, go out and flog themselves for a hundred kilometres or more. A Mystique, on the other hand, will ride with purpose. Each week David has structure and flow so that the legs are getting what they need. While he doesn’t have the time to train significant hours, the hours he does put in are completed with forethought for optimal gain. Dave uses four-week training blocks where each week builds upon the previous week. Each block is followed by one rest week. Dave makes sure to include plenty of socialising and coffees during and in-between his training. Efforts: During many training rides David will put in some big ring efforts, whether it is on the flats or in the hills. The idea is to be at a lower cadence and drive resistance through your legs for five to twenty minutes at a time. Just like going to the gym, this builds leg strength and conditioning so you can become a stronger and more astute cyclist. In addition to this, Dave trains with some high cadence and intensity efforts to replicate the speed required for race conditions. Meals: While David wasn’t always diligent with his eating, his wife has certainly transitioned his thinking over the years – and to good effect. As men hit the age of thirty their testosterone levels will fall by one percent each year. The body’s ability to synthesize proteins, aiding recovery, starts to diminish from forty years of age. As the body ages and muscle growth and recovery becomes more challenging, the importance of good diet becomes paramount. David eats well. You won’t find anything processed in his diet. Instead you’ll find chickens roaming his backyard and plenty of greens always on his plate. With this type of discipline Dave is able to recover like he is still in his thirties. As the old saying goes: “recovery is where you make your gains”. You may have heard this before, but riding efficiently makes an incredible difference. Many MAMILs you see riding in groups typically epitomize inefficient cycling. They’re dropping the wheel, rolling the wrong way in the wind, and more often than not – when the pressure is really on – they noticeably hump the bike. A Mystique on the other hand is highly efficient. Like David, they ride smart; sitting on the wheel in the perfect spot, rolling in the wind the right way. When the pressure is on, they concentrate intently on keeping their bodies still with all power being isolated through the legs and into the pedals. What sort of difference will this make? According to David, anywhere between twenty to thirty percent less energy is spent when these simple techniques are followed. It’s no wonder that when a Mystique has their turn, the rest of the peloton can feel it. And in race conditions it’s a virtue of patience that ensures the right move at the right time. In addition to the efficiencies gained, riding smart comes with a distinguished look. Mystiques are in harmony with the road, providing other cyclists with a benchmark on how to ride a bike. 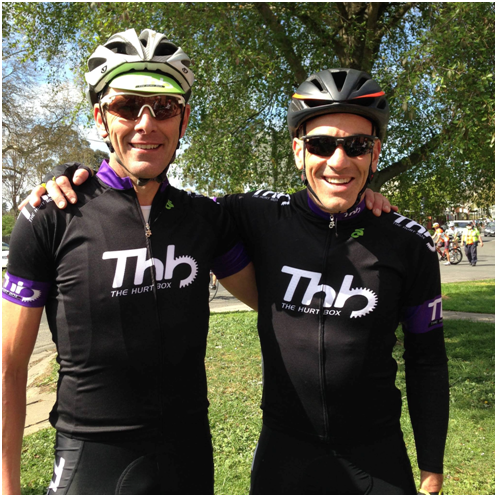 David Sturt with business partner Harry Hanley – two very smart cyclists. How does age impact a Mystique? Dave has only been training with Power for five years, so unfortunately he is unable to provide statistics on fluctuations in power output throughout his cycling journey. However, his ability to kick has noticeably diminished and his max heart rate is now ten beats lower than it was at its peak. Interestingly, in the time David has been training with power he has achieved some of his best results only in the last year. David looks at power efforts over one, two, five, ten, thirty minutes and one and two hours using Rider Metrics software, so he can benchmark himself against previous personal bests. Knowing that he’s been able to achieve some personal best results recently may suggest some Mystiques are quite like a fine bottle of wine! Like any fine wine bottle of wine, however, the ingredients and aging process must all be right. David has put himself in the best possible position to keep the competitive beast alive; something we can all achieve if we follow David’s example. Well played David – thank you for being an inspiration to us all. Interesting read. At age 43 it certainly delivers some inspiration. What a fantastic article Cam….a very articulate and accurate overview. You absolutely nailed it. Finally an article that explains in detail what bike riding is about particularly training techniques and benefits of a sold training program. Can you please send a typical training program for someone who is starting to utilise a road bike for fitness. Mmmm you forget that some athletes are born with super powers and are not made 99% percent of us not matter how much training we do will be like that . Steggles is Melbourne’s god of Masters cycling. Don’t forget, he hasn’t just ridden the Tour of Bright at MAS level many times, he’s gone and won it a few times too.